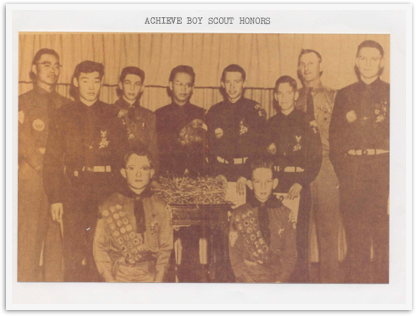 Richard Hurley served as Scoutmaster from 1955 to 1970. Sometime after that, he made a list of all the Scouts he could recall, and noted whether they made Eagle. I have some other info from those years - charters, courts of honor, newspaper articles, but it is incomplete. He didn’t remember everyone. Many of the Eagles were invited to the Centennial of Trinity in 1983. March 11, 1970 Court of Honor program - last number is Tenure. 56, 57, 58, 59, 61 (part), 63 (part), 64 (part), 67, 68 (part), 69. This is 78 of the 211 Scouts he listed.